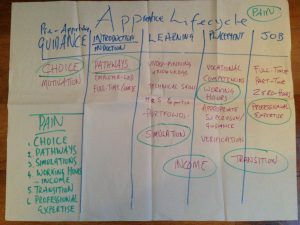 The apprenticeship life cycle: what are the pain points? We asked the FE and Skills Coalition group this question at their October meeting and got some interesting replies. 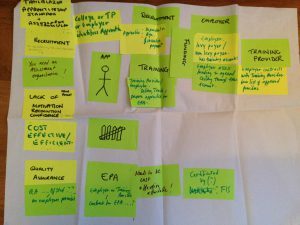 A range of participants representing many types of training providers, awarding organisations and other professional bodies sketched out their own views of the lifecycle and highlighted key pain points. We will be consulting further on this topic in order to see how technology can help address the issues. Take a look at the suggestions so far and let us have your comments. It is not necessarily a single cycle it may repeat many times. It starts once the learner has their competencies and gaps identified and finishes when they have no more gaps to fill and move on to something else (employment or further study). It is like a game of Monopoly. People start out not realising that they might not get a job at the end of it. Managing learner expectations is crucial. This process view makes a key distinction between on and off the job training. 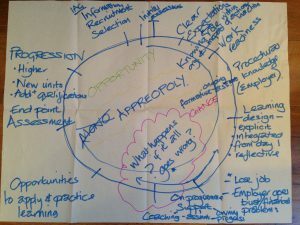 A more linear perspective on how the student might move through from school to decision to study apprenticeship, employer, qualification, vacancy, apply etc. 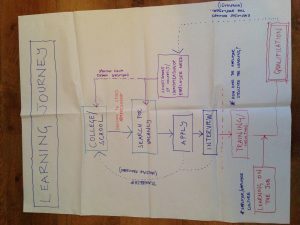 How does the employer structure the learning as they aren’t involved in designing the learning experience? How do we prepare the apprentice for potential future self employment as well as this specific job? This was more of a high level view of the regulatory landscape. Trailblazers are at the start of the process as nothing can happen until apprenticeship standards are set and funding models are in place. Employers and training providers both need a way to track the apprenticeship and prepare for endpoint assessment. 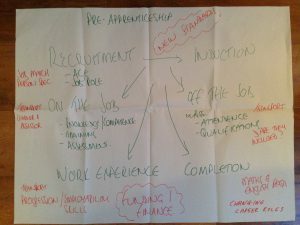 This version is a learning journey illustrating the six things we want apprentices to demonstrate. The key transition is from a college focus to a rounded self. Every apprentice is working to a learning contract. This is about personal learning spaces so is very e-portfolio focused. Technology is becoming more personal. Behaviour is moving from passive to active. The pain points are associated with the behavioural change. This group focused most on the pain – it is a horror movie. The choice at the beginning and commitment to a particular vocational pathway is very difficult. There are challenges relating to actual ways of learning and the working culture. It can be very lonely. This is meant to be simulating what life as a professional will be like. Why do we think a 16-year-old can make a lifelong vocational choice? There is an opportunity for learning providers to give more pre-choice support to help apprentices make more informed choices. This group started from the perspective that we need to start with the employer first not the learner. Apprentices are different to learners in full-time academic programs. These learners have already made a choice. The correct starting point is the job role of the employer, mapping this to the most relevant standard and linking standard and job role. This can be done totally digitally. 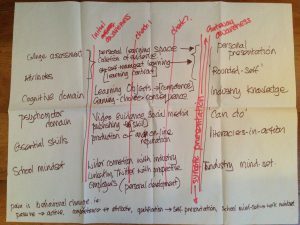 The process is driven by the employer needs but the MIS system starts with the learner. Every learner applies for a vacancy that is advertised online. Instead of asking for CVs why not collect the information for the ILR/ILP directly? CVs can often be written by schools and parents. By collecting the information direct you take out this link. A spell check in the system can identify dyslexia immediately. The system can also screen learners who aren’t eligible for the apprenticeship. 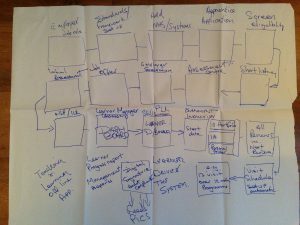 This group sketched out a fully digital lifecycle suggesting that technology can address most of the pain points. Posted by Gill Ferrell on November 21, 2016 in life-cycle and tagged assessment, end point assessments, levy, support, training.